Oh wait, that's not a typo. 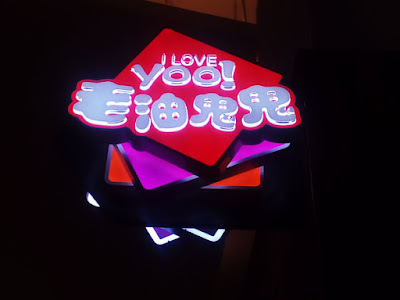 You don't love me, you're just selling the Taiwanese breakfast! Because my vacation was too short, I had very limited time to spend in Puerto Princesa City. Very little time that it only served as my transit point to San Vicente. Because my flight arrived at 3PM, too late for the last trip (at 2PM) to Brgy Port Barton in San Vicente, I had to stay the night in Puerto Princesa City. They put me up in Room 13; the room and its en suite toilet and shower were clean. It had a wall fan, table, stool, a shelf (in lieu of a cabinet), and four outlets. It had a sliding window with a screen (for when you want to let some air in, but not the mosquitoes) and with too short a curtain (for when you want some privacy, but not really...since this cabin is a bit elevated, the bottom part of the window, where the curtain fails to cover, is eye level to people passing by). Towel (for a deposit of Php 100), soap, shampoo, and toilet paper were provided. The only downside to that room was the threadbare bed sheet and the window screen which did not have a lock so I had to close the glass windows (which had a lock) at night. Luckily it was raining, and the room, with the fan on steady, was comfortably cool. I stayed at Natua's Cabin a second time, a few days later, and was put up at Room 25. This was a corner room and had windows on two sides. It, too, was clean. The bed sheet this time was better and the curtains longer. But it still had a downside: the door knob was broken and I had to check it a couple times to be sure it locked properly. Natua's Cabin is right beside the airport (very convenient if you have an early morning flight the next day!) but I hardly heard airplanes. Rooms are clean, comfortable, and affordable. 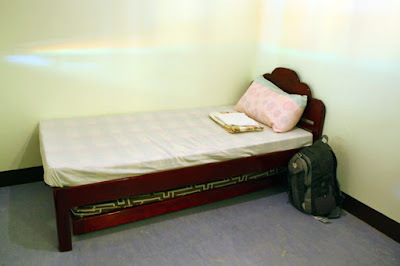 The single fan room costs Php 450 a night; single AC room at Php 800. WiFi is available at the restaurant. After check out, you may leave your bags at the reception. Not all rooms are perfect: bed sheet may be threadbare, doorknob might be broken, curtain may be too short. Inconsistent: It is stated in the website that breakfast is included, but when I got there they said breakfast isn't included for the room I booked. WiFi signal at the cabins is either weak or nonexistent. When it rains, you will need an umbrella to stay dry when going from the reception/restaurant to the cabins and vice versa. Because my time in Puerto Princesa was too short to go on a Honda Bay Tour (and I had already done the City Tour years ago), I killed time in Puerto Princesa by eating. So as not to feel guilty for doing nothing but eat, I went for healthy food at Imas Vegetarian Restaurant. I ordered tempeh (Php 100), grilled mushroom and eggplant sandwich (Php 120), and calamansi juice (Php 70). When I asked the server what tempeh was she only said fermented soy beans. It didn't sound appealing, but I ordered it anyway. And I am glad I did. It turned out to be soy fries (or something like that) and tasted interesting...in fact, I loved it, and I kept popping it into my mouth 'til my plate was clean. As for the sandwich, I loved the smokiness of the grilled mushroom and eggplant. Plus they weren't stingy with the sandwich filling. I visited Rene's Saigon on a rainy morning with my stomach rumbling for bahn mi (french bread sandwich) and a hot noodle soup. Unfortunately, the former was unavailable as they still had to bake their bread (I guess it is best to visit them after 3PM for bahn mi cravings). For only Php 80, the hot beef stew noodle soup, though the noodles were too sticky and clumpy, sure hit the spot that rainy morning. Because I had to go to Port Barton the next day, I had to catch a van ride at San Jose Terminal. The terminal, some seven kilometers from the airport, is where vans and buses to different parts of Palawan, such as Taytay, Roxas, Port Barton, San Vicente Poblacion, El Nido, Rio Tuba, etc begin their journey. The cheapest way to get to San Jose Terminal from the airport is to take a tricycle to Junction 1 (Php 8), then a jeepney (or "multicab" as the locals call it) to San Jose Terminal (the sign on the side of the jeepney/multicab would be San Jose/New Market/Terminal; the last stop is the San Jose Terminal; fare from Junction 1 to the terminal is Php 13). This tricycle and jeepney/multicab combo would only cost you Php 21. A more expensive option (if you're going solo) but without the hassle of transfers is to hire a tricycle (Php 70). Ahh what a fun day at the beach! And I still have a day or two of lazy beach days to go before I go home. But two more days to let my saltwater–drenched swimming clothes ferment into a stink bomb? No way do I want to lug a bagful of clothes that smell like dead sea creatures. But I am too lazy to do laundry right now. What to do? Wash 'em in fresh water and hang under the sun to dry. (The stinkiness will be less potent.) Proper washing (with laundry soap!) will have to wait til I get back home.